It's really tough to write a proper and worthy description for this Universal Genève Compax 124107. For us, this is one of the most beautiful chronographs of all time and a great collector's watch. On the case back, this 1940s chronograph features an ultra-rare engraving by the Brazilian Air Force "F.A.B": Fuerza Aérea Brasileña. In the first half of the 20th century, Universal Genève equipped the pilots of the FAB with its chronographs. But only the mint condition of this Universal Genève Compax makes this watch an extraordinary and irreplaceable collector's item. The massive pink gold case is unpolished, has razor-sharp lugs and is virtually free of signs of wear. The diameter is 37mm, which was very rare in the 1940s. The silver dial is absolutely flawless. The Arabic numerals have original trtium lume with a fantastic patina. The hour and minute hands have a nice diamond shape. The hands of the subdials and the chronograph seconds hand are blue. Their color changes at different viewing angles from light blue to dark blue to black (see pictures). The dial has a red telemeter scale and a blue tachymeter scale. This UG Compax is powered by the manual wind movement of caliber 287. It was checked and runs flawlessly. Historical relevance. Stunning design. Mint condition. 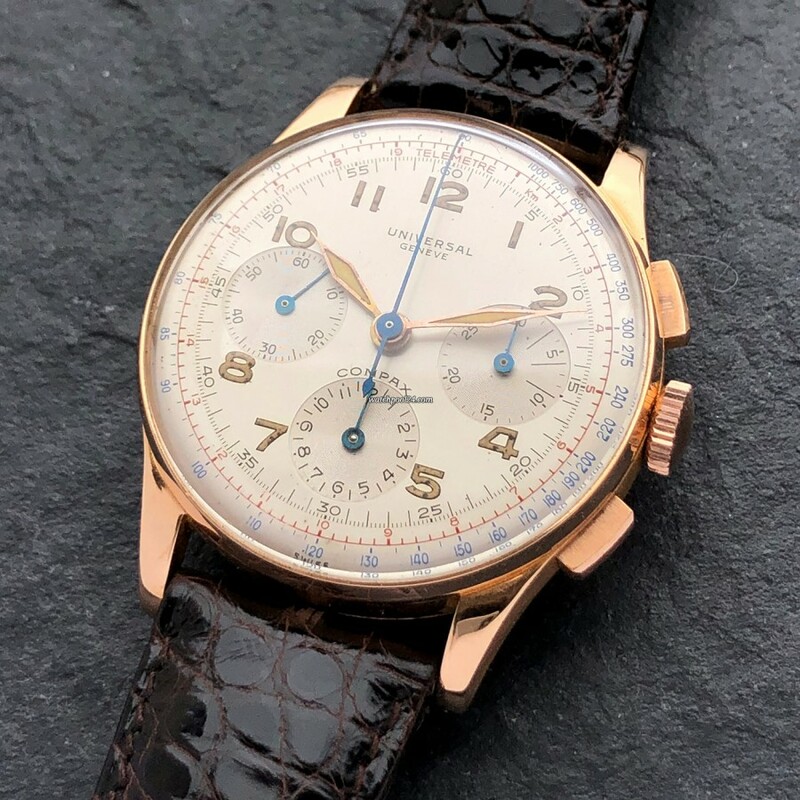 This Universal Genève Compax Ref. 124107 is a special vintage watch. It is probably impossible to find this model in a comparable condition a second time.